Penguin lovers look away now; your cute little friends are in a whole heap of trouble. Ahhh man, gotta feel for these penguins. Just look at that image on the right-hand side, they’re absolutely terrified because they know they’re soon about to be slaughtered. And they’re so damn cute too! So heartless. But, worry not, for the most part, the penguins are in great spirits wandering around beside the reels without a care in the world. It’s only when you hit the bonus that they’re in peril, so I hope you feel guilty when you trigger it. In terms of the aesthetics and everything else, it’s bloody beautiful. 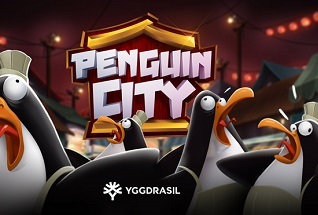 Awesome graphics, silky smooth animations, and really fun gameplay with a bonus round that appears so often (sorry penguins!). The symbols? Well, they’re all related to Oriental cuisine with a box of noodles, soy sauce, a soup, a broth and a big knife all featuring plus a heart, a diamond, a jack and a spade. 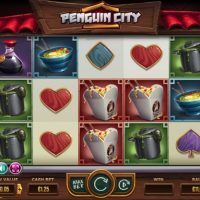 The best symbol to hit is the box of noodles which pays out 250/1 should you hit five in a row. 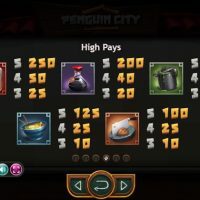 The bonus round is triggered by getting a Wild and winning with that Wild – simple. 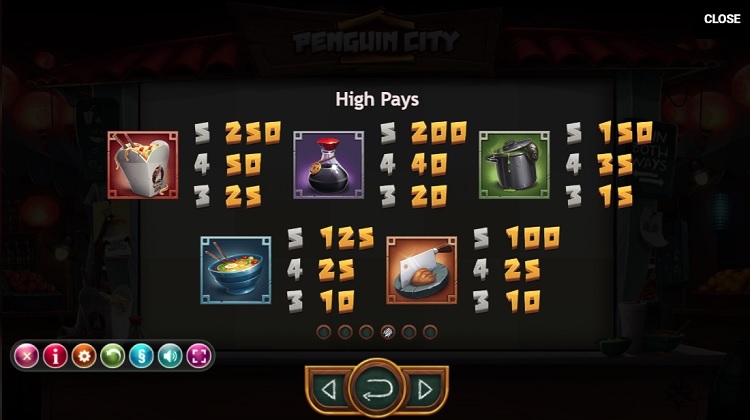 The bonus round is a little bit weird on Penguin City. 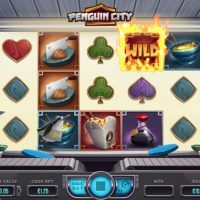 Basically, the reel gives you free spins, but once you get a spin that doesn’t win, the bonus round is over. Meanwhile, below the reel, penguins are trying to escape from the kitchen by jumping on these mini trampoline things. If they escape, you get a wild on the reel. I told you it was weird. 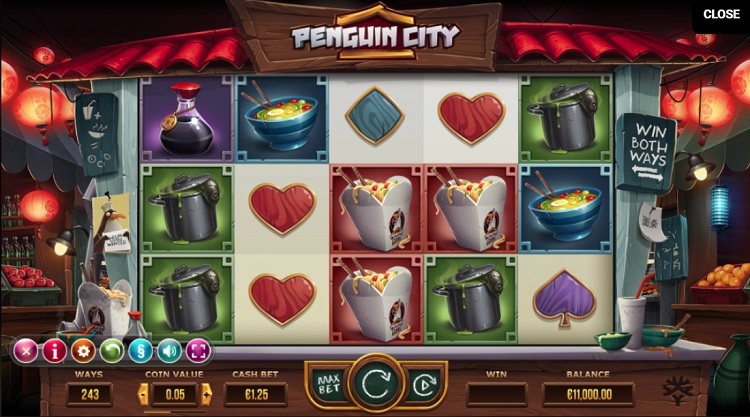 You can’t bet on different lines on Penguin City, but you can bet between 10p and £125 per spin. The house edge is a decent 3.8%. What a game. I know we should feel a little bit sorry for the penguins, especially when you see them escorted away in a takeaway box still blinking, but at the end of the day, and this may shock you, they aren’t actually real – they’re just animated! 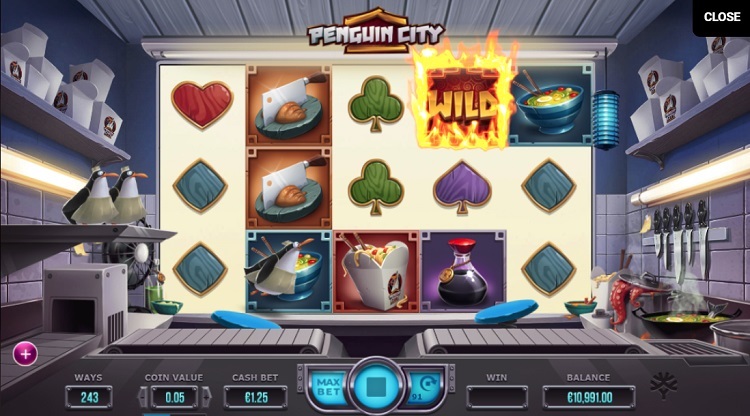 So now your mind is at rest, you can enjoy this slot for just what it is – a game! And a game that doesn’t kill any kind of real animals. 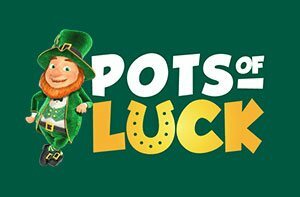 A game that has lovely graphics and animations, a game with a very low house edge, and a game with a huge amount of paylines which pays out huge wins. So forget about those slaughtered, artificial penguins, you’ve got better things to do!